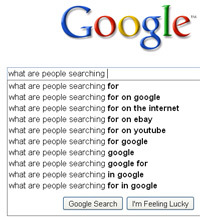 Before 2009 came to a close, Google provided a look (as always) at the most searched for terms of the year. It showed the top ten fastest rising and fastest falling terms on both a global scale, and in the U.S. Globally, "Michael Jackson" was the fastest rising, while "Beijing 2008" was the fastest falling. In the U.S., "Twitter" was the fastest rising (just above "Michael Jackson", and "John McCain" was the fastest falling (just over the Olympics).